Power(s) given Floats on water. 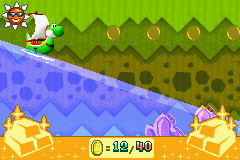 The player is able to tilt the waves, which will affect how Ship Yoshi moves. 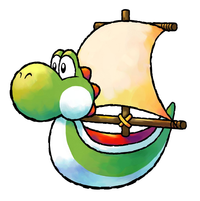 Ship Yoshi is a transformation found in the game Yoshi Topsy-Turvy. It is first encountered in Chapter 3 and are used only in areas with water. Yoshi can float above the water and continually move forward. The water level can be changed by tilting the console left or right, which is necessary to complete the area. If Yoshi touches the ground and there is no water where he is, he cannot move, but if the water touches him he can move again. Getting held back by an object may cause Yoshi to go off-screen and he will lose a life. This page was last edited on November 13, 2018, at 16:57.